Aboriginal Languages of Australia - There are more than 200 Australian indigenous languages. About 20 languages are strong, but endangered: the others have been destroyed, live in the memories of the elderly, or are being revived by their communities. This site has annotated links to 180 resources for about 60 languages. About 25% of these resources are produced or published by indigenous people. Acronym Finder - Look up five million acronyms/abbreviations and their meanings. American Dialect Society - Dedicated to the study of the English language in North America, and of other languages, or dialects of other languages, influencing it or influenced by it. 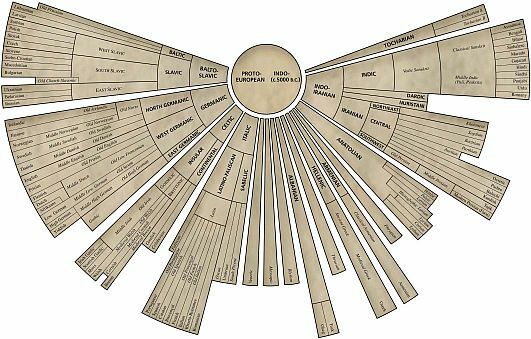 Ancient Scripts of the World - Writing systems, bibliography, sounds and phonetics, resource links, historical linguistics. Arabic Language and Arabic Alphabet - At the Arab Gateway. Archive of Indigenous Languages of Latin America (AILLA) - A digital archive of recordings and texts in and about the indigenous languages of Latin America. Babel Fish - Translate text. Banished Words List - Lake Superior State University's Annual List of Words Banished from the Queen's English for Misuse, Overuse and General Uselessness. Center for Advanced Research on Language Acquisition (CARLA) - Supports a number of interrelated programs of research, training, development, and dissemination of information related to second language teaching, learning, and assessment. Center for Language Technology and Instructional Enrichment (CeLTIE) - Indiana University-Bloomington's (IUB) CeLTIE provides leadership and technological expertise to support language teaching, learning, and research. Creole Language in Haiti - Wikipedia backgounder. Also see Common Creole Words and Phrases. Disappearing Languages - A National Geographic backgrounder. A Narrative History of England (Peter Williams) - From pre-Roman times to the present. American Heritage Dictionary (Project Bartleby) - Useful for etymologies, which go back to Indo-European roots. Cambridge History of English and American Literature (Project Bartleby) - Complete English literary history. Take Our Word for It - A weekly web magazine of interesting origins of English words. World Wide Words (Michael Quinion) - Information about interesting English words. Interactive Sagittal Section (University of Toronto) - Shows points and manners of articulation for various phonemes. International Phonetic Association - Promotes the scientific study of phonetics and the various practical applications of that science. Also its International Phonetic Alphabet. International Phonetic Alphabet (IPA) Artiulators - Facial chart locates parts of the speech-producing mechanism, provided by SIL. Phones and Phonemes of English (George Dillon) - Descriptions, charts, sounds of phonemes. Phthong (University of Toronto) - Exercises for phonemic transcription. Phonetics: The Sounds of American English (University of Iowa) - Click on English sounds library. Indo-European Language Resources (Sean Crist) - Gothic, Old English, Old High German glossaries, Tocharian texts and notes. Seven Distinctive Features of Germanic - Linguistic features, Grimm's Law. Complete Corpus of Anglo-Saxon Poetry - Texts of all surviving Old English poetry; no translations or recordings. Electronic Sermo Lupi ad Anglos (Melissa Bernstein) - Old English sermon with manuscript image, texts, translation; good for learning to read Old English script. King Alfred's Old English Grammar - Complete Old English grammar with modern grammar review, useful exercises. Old English Aloud (Steve Pollington) - Texts, readings in Old English poetry. Online Course in Old English (Murray McGillivray) - Pronunciation, grammar, texts, recordings. Chaucer's General Prologue - Text, translations, RealAudio recordings, bibliographies. Chaucer's Language, Pronunciation, and Vocabulary (Harvard U.) - Explanations, charts, sound recordings of phonemes and texts, grammar of Middle English. Corpus of Middle English Prose and Verse Search Engine (U. of Michigan) - Locate words and phrases in ME literary works. Library of On-Line Middle English Texts (Labyrinth) - Texts without translations. Middle English Compendium (U. of Michigan) - Through Cook Library - on-campus access only. TU Chaucer Course Home Page - Texts, audio, links. Complete Works of William Shakespeare - From MIT. Renascence Editions (Richard Bear) English works printed 1477-1799. Language Varieties (University of Hawai'i) - This site is about varieties of language that differ from the standard variety that is normally used in the media and taught in the schools. These include pidgins, creoles, regional dialects, minority dialects and indigenized varieties. Phonological Atlas of North America (University of Pennsylvania) - Descriptions, maps, links. Yankee or Dixie Quiz Test is based on results from a Harvard Computer Society Dialect Survey of 30788 respondents. Esperanto USA - Non-profit educational association of Esperantists in the United States who have a common interest in using and promoting Esperanto. Ethnologue - Contains information on 7,105 known living languages. Forvo - The largest word pronunciation dictionary in the world, now with translations. All the words in all the languages pronounced by native speakers. FreeTranslation - Free text translation. FSI Language Courses - Allows users to find and download old Foreign Service Institute training materials, including entire texts and (wherever possible) their accompanying audio cassette tapes. The materials are in the public domain, and cover more than 40 languages (among them LCTLs like Korean, Arabic, Hausa, and Vietnamese). HandSpeak - An exploration of imagery language and visual communications, cultures and arts. Hebraica Team - Catalogs books written in Hebrew, Yiddish, Ladino, Judeo-Arabic, Aramaic, and any other language using the Hebrew alphabet - everything from medieval biblical commentaries to contemporary Israeli poetry. iLoveLanguages - Catalog of language-related Internet resources - over 2000 links. inogolo - Devoted to the English pronunciation of the names of people, places, and miscellaneous stuff. The site contains a searchable database of names with both phonetic and audio pronunciations in English. International Accent Marks and Diacriticals - Typing foreign language characters on your computer. Jewish Language Research Website - Presents contacts, descriptions, and basic bibliographies for the following languages: Hebrew, Jewish Aramaic, Jewish English, Jewish Malayalam, Judeo-Arabic, Judeo-French, Judeo-Greek, Judeo-Iranian, Judeo-Italian, Judeo-Persian, Judeo-Portuguese, Judeo-Provençal, Judeo-Spanish, Judezmo/Ladino, Yiddish. Klingon Language Institute - Those bumpy headed aliens of Star Trek really have their own language, one which has far outgrown mere television and film. The Klingon Language Institute continues its mission of bringing together individuals interested in the study of Klingon linguistics and culture, and providing a forum for discussion and the exchange of ideas. Language Learning Software & Resources Available in Over 100 Languages - Includes brief overview, history, statistics, survival phrases, and information on grammar. Provided by Transparent Language. Language Policy Website and Emporium - James Crawford's reporting on the English Only movement, English Plus, bilingual education, efforts to save endangered languages, and language rights in the USA. Like a Spaniard - Slang and idioms from Spain. Linguist List - International Linguistics Cmmunity Online - Extensive directory provides linguistics news, information, resources, conferences, dissertations, discussion groups. Also see Directory of Linguists. Live Search Translator - Free online translation service. Living Swahili Dictionary - New dictionaries of the Swahili language, both within Swahili and between Swahili and English. Swahili is the most widely spoken African language, with 50 million speakers in East Africa and Central Africa, particularly in Tanzania (including Zanzibar) and Kenya. Martindale's Language and Translation Center - Dictionaries, courses, lessons, online keyboards, spell checkers, text-to-speech, literature, poetry, videos, movies, etc. Includes over 2,350 languages. Modern Language Association (MLA) - Founded in 1883, the Modern Language Association of America provides opportunities for its members to share their scholarly findings and teaching experiences with colleagues and to discuss trends in the academy. MLA members host an annual convention and other meetings, work with related organizations, and sustain one of the finest publishing programs in the humanities. Mo'o and Lolo's Hawaiian Dictionary - Contains close to 5,000 Hawaiian-English and English-Hawaiian words. Native Languages Program Directory - A directory of those who are working for community-based language instruction. Online Dictionary - English to Spanish, French, German, Japanese, Chinese, Italian, and Spanish translation. Open Language Archives Community (OLAC) - An international partnership of institutions and individuals who are creating a worldwide virtual library of language resources. Oxford Dictionaries - Oxford's innovative modern English dictionary and language reference service. Phonetics and Linguistics - At University College London. Also, see Resources and Tools in Speech, Hearing and Phonetic Sciences. Rosetta Project - The Rosetta Project is a global collaboration of language specialists and native speakers working to develop a contemporary version of the historic Rosetta Stone. In this updated iteration, the goal is a meaningful survey and near permanent archive of 1,000 languages. The Project's intention is to create a unique platform for comparative linguistic research and education as well as a functional linguistic tool that might help in the recovery of lost languages in unknown futures. Rosetta Stone - Language learning software. Silva Rhetoricae - Guide to the terms of classical and renaissance rhetoric. Slangopedia - Hosted on the website of the Italian newsweekly, L'Espresso, offering around 1,000 entries on slang terms. Terralingua - An international NGO focussing on linguistic, biological and biocultural diversity language endangerment/survival/preservation and linguistic human rights. Thai-language - Here you'll find 13823 audio clips, over 55594 dictionary entries, 826 images and illustrations, message boards, and a world-wide community of folks interested in Thai language, culture, residency, and travel. UCLA Language Materials Project (LMP) - UCLA learning resources for less commonly taught languages of the world. Thousands of resources covering 80 languages. UngusTV - Learn Spanish by watching TV. Verb Conjugation Online - Conjugate verbs in over 100 languages. Voice of America Pronunciation Guide - Audio files and pronunciation guide for thousands of names of people, places, and events found on VOA worldwide broadcasts. Web of Online Dictionaries - Indexes online dictionaries, thesauri, and such containing words and phrases. Word Spy, The - Devoted to recently-coined words, existing words that have enjoyed a recent renaissance, and older words being used in new ways. World Wide Words - Devoted to the English language - its history, quirks, curiosities and evolution. Investigates international English from a British viewpoint. WorldLanguage Resources - Vendor. Arabic, Bengali, Croatian, Czech, Danish, Dutch, English, Farsi, Finnish, French, German, Greek (Modern), Gujarati, Hebrew, Hindi, Hungarian, Indonesian, Italian, Japanese, Korean, Latin, Malayalam, Marathi, Norwegian, Persian (Farsi), Polish, Portuguese, Punjabi, Russian, Serbian, Spanish, Swedish, Tamil, Telugu, Thai, Vietnamese. WordReference - Free access to numerous dictionaries (mostly Romance languages: Italian, Spanish, French, and Portuguese) plus a verb conjugator for many of the words it defines. Wordorigins - Devoted to the origins of words and phrases, or as a linguist would put it, to etymology. WordReference - Translate any word in any Web page with a few quick clicks, using the Collins translating dictionaries from HarperCollins Publishing. This webpage last updated on Thursday, July 13, 2017 9:55 AM.